It’s when companies under-promise and over-deliver that people experience memorable moments that will affect their habits for a lifetime. In a small restaurant in Shinjiku, a suburb of Tokyo, I ordered sake. First, the waitress placed a small wooden box in front of me. Then she arrived with a large tray carrying 40 cups. Each one, she explained, represented a different personality. I chose a blue cup, which she removed from her tray and carefully placed in the box. Do you remember the last time you got more than you expected? Perhaps you were shopping for groceries or even buying something online. Am I right in assuming that, rare as these occasions are, when they happen you don’t forget them? 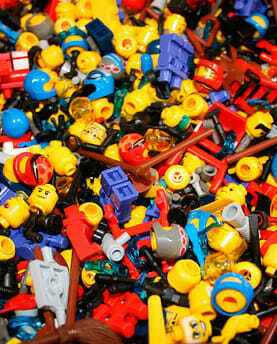 When I was a kid, I was a devoted LEGO builder, collecting box after box. I came to realize that LEGO always placed a few extra bricks inside the box, bricks never accounted for on the list of inventory. Over the years I began to accumulate a secret collection of LEGO’s gifted bricks. Funnily enough, I valued this collection above all others. It took on a kind of sacred quality. Some years later, I visited the factory and the manager told me that those extra bricks were more a matter of practicality than goodwill. They were included in an attempt to circumvent thousands of requests from distraught parents who had unsuccessfully searched for that missing piece lost under the carpets or beneath the furniture. Devalued as my collection of special bricks may have been in that childhood moment, what LEGO had inadvertently achieved was to over-deliver and under-promise. And that’s what stuck with me. These days, we seem to be following a reverse philosophy. We over-promise and under-deliver. Or, at best, we deliver exactly what was promised–nothing more, nothing less. Just think of that pre-packed shrimp salad you bought, where you found that there was not a single shrimp amongst the lettuce, only the four at the top of the plastic container. Or the big bag of potato chips that is more air than chips. In general, we are more familiar with a leaner scenario than we are with excess. Several years ago, I checked into the Peninsula Hotel in Chicago. I asked the concierge if it was possible to borrow some music CDs. Over the years, I’d grown accustomed to listening to music supplied by other hotels in the Peninsula group. It’s a service they offer to all their regulars. As the hotel was new, the clerk politely informed me that this particular Peninsula had no CD library. Oh, well, so it goes. Yet minutes later, the concierge called to ask me what my favorite music was. Eminem, ABBA, and the Beatles, I replied. I was curious about this, but it slipped my mind as I continued working. Now’s let’s pause here for a second. I’ve related this anecdote to hundreds of thousands of people attending my conferences–and to millions who have watched my TV appearances. My guesstimate would be that some 15 million people have heard this story. The cost to the Peninsula? About $22.50. Needless to say, the Peninsula experience is far from common. However, every time I hear consumers raving about a brand, almost without exception it’s been the result of the brand over-delivering. In a world where promises are routinely ambiguous or broken, when we encounter such service we find it, quite literally, remarkable. Small acts of generosity imbue us with that rare feeling of being cared for or considered by a company. Perhaps, when it comes down to it, we’re still kids falling under the spell of surprise. If it’s better than what we expected–or hoped for–we remember it above all else. Who knows? Maybe the brand manager responsible for your favorite brand will not only read this article, but will act on it. Don’t get your hopes up–catering to you may cost a few dollars more than what has been budgeted. After all, few people are willing to step outside the plate and eat into the budget that’s already been set aside for things like consultants or social media ads.